A quick update on a few things…. Congratulations to all of those who swam over the weekend! Meanwhile, Mark Hageman and I headed further south down to Pacific Masters Association Champs which were held in Santa Clara, California. We got very lucky with the weather and we both had some very good swims. A photo of Mark and I enjoying the California sunshine is below. It was a very fun weekend! I am sure there are plenty of great swims to report on from the weekend, but one particularly notable swim was made by our Dan Kirkland. 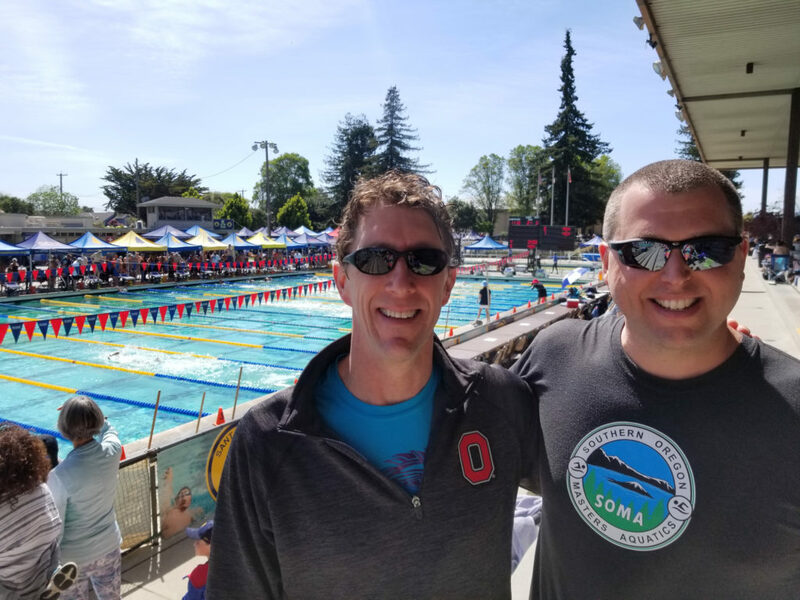 Yesterday afternoon at the 2019 PNA Championship Meet, Dan Kirkland set a new national record in the 1650 freestyle going 20:03.68 and taking 25+ seconds off the previous record held by Olympian Graham Johnston. Congratulations, Dan!! And “honorary” SOMA member from Coos Bay, Ralph Mohr, will also be attending. Wish all of us luck! It is only 4 weeks from the biggest swim meet of the year in Oregon. Everyone should plan on attending! Last year we had 30 SOMA people registered and this year is looking like we will have even more. We should be in a good position to challenge Oregon Reign Masters for 1st place in the large team division again. Let’s get it done this year! The price is around $100 a night. I made a non-refundable reservation for a room with 2 queen beds for Friday and Saturday night on Hotels.com and got a reduced rate of $91 (not including tax). OK, that’s all for now. Keep steady with your training and I am looking forward to seeing all of you in just over a month in Tualatin Hills where we will all have some serious fun! !